The Full Moon in Sagittarius was in conjunction with 38628 Huya, a trans-Neptunian object named after the rain god of the Wayuu people of Venezuela and Colombia. Venus in Cancer, Jupiter in Scorpio and Neptune in Pisces are forming a grand trine aspect pattern in the water signs. Uranus in the early degrees of Taurus is opposite Typhon retrograde in Scorpio. 38628 Huya is a plutino discovered in March 2000 by Venezuelan astronomer Ignacio Ferrin. Like Pluto, Huya spends part of its orbit closer to the Sun than Neptune. It came to perihelion (the point in its orbit where it is nearest to the Sun) in December 2014. It will be closer to the Sun than Neptune until July 2029. I tend to forget that 38628 Huya is a binary system. The satellite was discovered in 2012 and it has not been named yet. Pulowi would be an apt name for the satellite, because in Wayuu mythology Pulowi and Juya were a married deity couple associated with procreation and life. Pulowi is related to dry seasons and Juya controls the rain. Lack of water is a huge problem for the Wayuu people, who inhabit the arid Guajira Peninsula, and that is why the object was named after the rain god. In Florida a subtropical storm Alberto made a landfall on Monday. In North Carolina and Maryland rain and flooding have caused damage and loss of lives. At the same time the weather here in Finland is dry and hot. The month of May has been the warmest we have ever experienced, since the official recording of the weather began in our country. Open fires are strictly forbidden, because the risk for forest fires is historically high now. The environment of the Wayuu people has been polluted by the coal mining industry. They have been forced to relocate and leave their ancestral land. A Wayuu leader Jorge Montiel has said: “We will not be removed from the lands where our ancestors are buried. We are defending the animals, the forests and the water. This planet can’t withstand any more contamination. What good is all this wealth from oil and coal if we are dying of diseases and misery?” At the time of the total solar eclipse in Scorpio on November 13, 2012, Finland was in the midst of the worst environmental crisis in its history, when a waste water pool at the Talvivaara mine in Kainuu started to leak. The eclipse was in conjunction with 38628 Huya. Our seas and oceans can’t withstand any more plastic. Last month a young sperm whale washed up on a beach in southern Spain. It had 64 pounds of plastic and waste in its stomach. Sperm whales are in danger of extinction. Around 150 million tons of plastic are already floating in our oceans. On Monday the European Commission proposed a total ban on single-use plastic products such as plastic straws and cotton buds. Although we all as individuals are responsible, this is a step to the right direction. The pressure has to be put on the production. 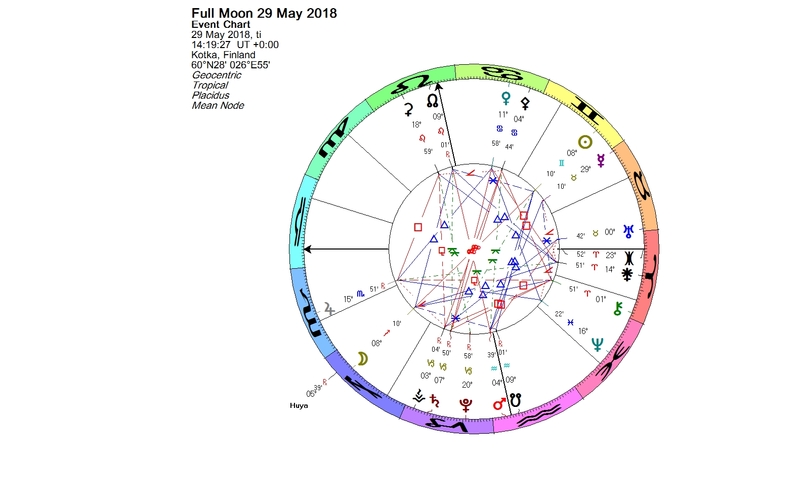 This entry was posted on Wednesday, May 30th, 2018 at 9:34 pm	and is filed under Full Moon. You can follow any responses to this entry through the RSS 2.0 feed. You can leave a response, or trackback from your own site.